I got the beautiful little 3 transistor fuzz circuit boards. Thanks for your hard work on these. There is some irony in having these in the shop, their compactness and organization is so far beyond what the original kluge board looked like back at West Coast Organ and Amp that it makes me laugh. Cheers! I am still digging the 3 transistor WC fuzz that Tek built for me, and I apologize for not having found the time to put up a clip yet! Least I could do in return for yours and Tek's work, but there's just been too much on my table. Still haven't finished the pedal board it is going on either, but it's close. Between the 6550s and subtle WC mods to the amp, the PPIMV and switchable cascade mod to the front end, and this fuzz, I have a setup which gives some killer late period Hendrix sounds. I want to put in a zero-loss FX loop to to finish it off, so I can add a little "Fillmore East-y" reverb. That should be the icing on the cake. Can't wait ! Can't wait !! i'm starting to desire a sustainiac system, that i could blend in with a pot, a push pull kind of fender pot, i don't know ... That could be sweet with endless notes, the fuzz, the WC amp. never tried a sustainiac. maybe it's just an active mini amp circuit that can be applied onto a non modded pickup ? Which reverb gear will you target ? Well yes I recognize that wah pedal, another of my "dirty tricks" from the past catches up with me. If the ghost of Vox ever finds me I may have to answer how I came to provide that pedal to Jimi six months before it became publicly available. Is this the woodstock wah that was sold at an auction a few years back? Cheers! I believe that's the one. I'm new to this forum. Wow very interesting stories and discussions. So there is a disscustion about the Fuzz settings Hendrix used. Fuzz@0-2 and Volume@10 using the FF as some sort of booster or Fuzz@10 and Volume dailed down. I say he used both, as can be seen in the 1969 Stockholm video (Maybe this observation was alreday posted, I'm only at page 22 in this thread). He started the show with the Fuzz@10 and occasionally turning it on (you can clearly see and hear him switching it on and off) like in spanish castle magic and fire. During Hey Joe, the FF is turn off. Never the less during the solo (20:00 min) he kneels down dimes the Volume and turns down the Fuzz (no difference is beeing audible since the FF was turned off). You can hear the difference in sound the next time he turns on the FF during the intro of Voodoo Child SR (24:03 min). That's a very good observation, I had not noticed before. Very interesting - you often see Hendrix fiddling with amp knobs, but I hadn't seen him adjust the fuzz before. Edit; listening to it now, you might think there is a change in sound when he turns down the fuzz (right hand knob on the fuzz when viewed face on), but I think that's just due to his position to the cab, and it starts feeding back. BTW, I finally found an appropriate 2M pot for my WC fuzz. Once I install that I can put in a battery switch, probably rewire to true bypass, install it on my board and *hopefully* finally get a clip together. Hang in there, guys! Hi guys, been a little while. I was off a little, got a new doctor for my hears, they did some test and apparently the inner ear pressure destroyed some part of the inner ear and i will be deaf on the right side for the rest of my life. Anyway they think its really not normal, i have to have an MRI done to my head so maby we can fix the vertigo. I think ive found some way to quiet the fuzz(when the gain i turned up). The 3 capacitor in the feedback network are doing some king of phase shiftinf of the NFB. 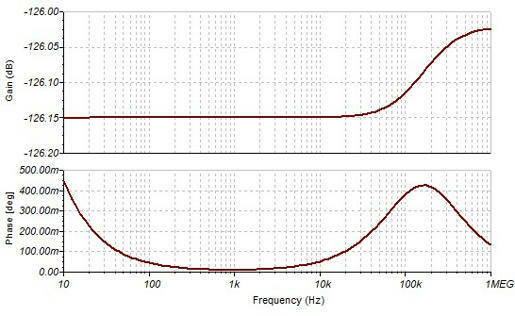 Removing the 100p may reduce alot of noise when the gain is turned up. let me know what your thinking, i will try to fire up my amp(wich was not firex up for 6 month) to test it when spirit kick in. Last edited by Tek465b on Sat Oct 20, 2018 3:28 pm, edited 1 time in total. Here we can see the phase angle of the NFB network's Current(with the gain maxed out, current and not voltage phase because Q1 is a current amplifier)..
and you add a NFB of 1 mA at 180 degree you end up with 0 mA at 0 degree(you cancelled it out). Now if we have 1 mA at 0 degree and add 1 mA at (180 + 80 degree) = 260 degree. or (180 - 80) 100 degree. we get 1.28 mA at -/+50 degree. so we are adding the noise and not removing it and maby we have an oscillator, thus the ringing in the above post(its probably well above 10kHz) . When you turn the gain pot up it increase the impedance of the NFB network, and now Q3C start to act as a voltage source. this is where all the shifting start to happen. With the 100p removed the 2Mmaxxed pot turn the input of Q1 from a current amplifier to a voltage amplifier to the NFB network, cancelling the phase shift. This is the best i can explain it to myself. I like your mindset about this, but the tech stuff is infortunately way over my head. Someone else will have to chime in. The fuzz is a touch noisy, but not really worse than a standard fuzzface. Certainly not when you factor in the amount of gain available. Well Tek, thanks for joining in. Always a pleasure to have your analysis. I am sure all of us here are sending thoughts and prayers for your hearing problems, I sure am. If you happen to read my earlier posts on the fuzz, you will find a caveat regarding the possibility of it becoming an oscillator at high frequencies. The premise is rather simple: if there is sufficient gain at a frequency where there is 180 degree phase shift, then the negative feedback becomes positive feedback, and you have an oscillator. 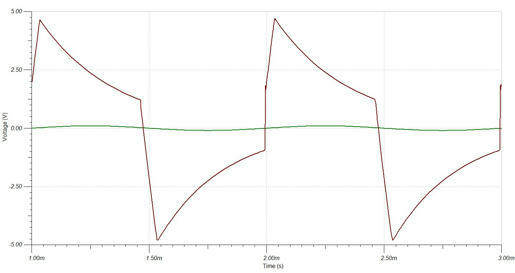 That's how oscillators work, in this case phase shift oscillators. 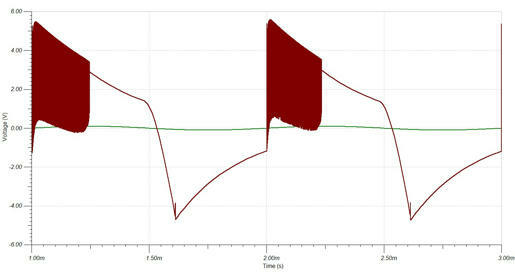 The actual feedback signal is in phase with the input signal. I you have a Marshall with tremelo, you can see it in the circuit; it is an amp, with three RC networks (resistors and capacitors in series from the output fed back to the input). 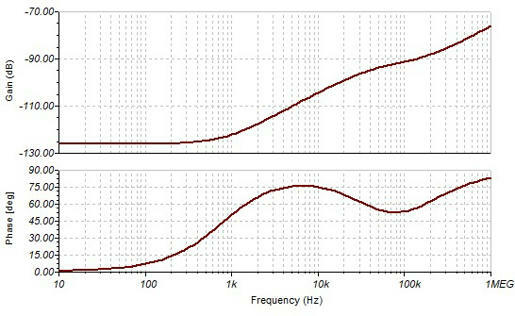 Each RC network has 60 degrees of phase shift at the frequency of the tremelo, causing the feedback signal to be in phase with the input. Think of the three transistors in the fuzz circuit as RC networks, each with a phase shift of 60 degrees at say 25 KHZ. If there is gain in the circuit at 25KHZ there will be an HF oscillation, just like Tek showed in his simulations. All this depends on the transistors you use, circuit wiring, proximity to ground planes, and so on. Amps with three poles (three amps with gain) are notoriously tricky to use with negative feedback. I tried to warn builders of the circuit that they may have to tweak the feedback caps or adjust the overall frequency response so that there is less gain at high frequencies. I had to. 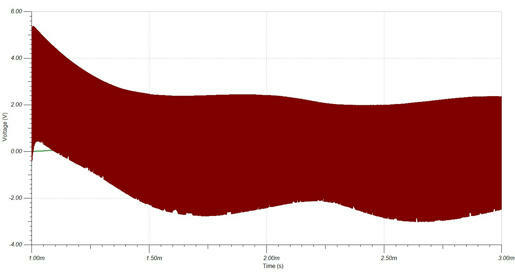 A HF oscillation can sound like noise in the circuit. You can also experiment with different value caps or or types of caps, and different value feedback resistors. I tried to get enough negative feedback around the loop to get a unity gain amp out of the thing when the gain was set to minimum, or close. But I do remember having to tweak it, in keeping with the transistors I used. PhilSt, I did want to comment on your observation; we certainly had some spirited discussions about Jimi's use of the FF, many folks astonished that I claimed that further in his career Jimi used gain or re-amping to get his distortion, and not fuzz per se. These discussions finally got to blowing out the forum and some of the comments removed. So I am glad you are here and pointing things out. One thing to keep in mind about Jimi's later performances is that all of his effects units had been modified (unless he had picked up a new unit at some music shop and used it). The fuzz of the earlier performances was gone, and a much cleaner type of fuzz was used. In some cases, depending on where he was and how his guitar responded, he used more fuzz for feedback. But the change in tone from the early days is pretty obvious. I think we had him talked into using more gain to get his tone and distortion, and less fuzz itself. Jimi was well aware of the difference, as the later amp mods and effect mods showed (all of these were based on input from Jimi). This is a topic that still has a lot of folks wondering, and probably contains a lot of latent energy as well.